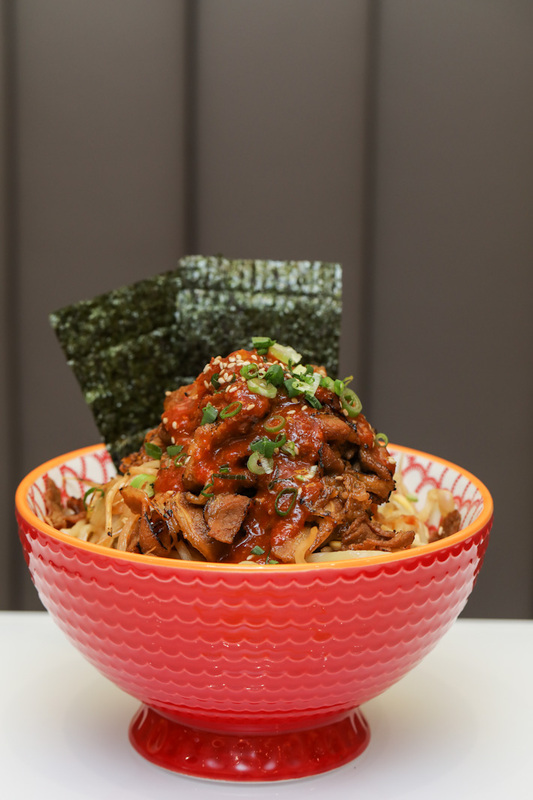 Aptly named after its appearance, Sora Boru’s Volcano Beef Don (S$11.90) is a glorified beef bowl of Japanese rice topped with your choice of stewed cabbage or seasoned bean sprouts and a massive pile of incredibly tender flame-grilled slices of beef. The cherry on top is the rivulets of ‘lava’ that run down the sides of the volcano, which is essentially Sora Boru’s special in-house concocted spicy sauce. Coating the heap of beef evenly and generously, the sauce adds that much needed fiery kick that makes this dish deserving of its volcanic title. On the other end of the spectrum is their Snow Beef Don (S$11.90) where instead of spicy gochujang sauce, the beef is doused in a unique homemade sweet and savoury sauce that is made from whipping cream. This is further enhanced by a generous sprinkling of grated parmesan which gives the dish its snow effect. In comparison to its spicy counterpart, the Snow Beef Don has a creamier texture as well as a much sweeter flavour that stems from the whipping cream. The contrast of the sweetness from the sauce with the savouriness from the parmesan cheese created a medley of varying flavours that definitely got us hooked! If we had to choose between the two, we admit that it won’t be an easy decision because we are equally obsessed with both of them. But if you really can’t make up your mind, then get both! We recommend getting the mini versions of both don (S$7.50 each) so that you can have the best of both worlds! Fans of chirashi-don would know that a decent bowl of this goodness does not come cheap. Here at Sora Boru, fill your bowl to the brim with juicy cubes of sashimi. Mini bowls are super affordable and are priced at S$6.50, while regular bowls are at S$11.90 and large bowls at S$16.90. What we also love about their chirashi-don is its customisability. Through a six-step process, diners can pick and choose their preferred bowl size, base, raw fish, add-ons, sauces and garnishes. Examples of some of the raw fish that you can choose to add into your ChirashiBoru are salmon, scallop, tuna, octopus and swordfish. If you want to up your chirashi don game, you can opt for their Bara Chirashi Ebimayo Aburi Don (Mini S$9.50, Regular S$16.90) instead. This bowl of goodness features cubes of assorted half-grilled seafood such as salmon and baby scallops, tamagoyaki, tempura bits and cucumber that are blanketed in an incredibly aromatic blow-torched shrimp roe mayonnaise. The savoury umami of the shrimp roe mayonnaise was reminiscent of the flavours of mentaiko. Blow-torching the decadent sauce also created a lovely char and an irresistible smoky flavour. Texture wise, the tempura bits added a lovely crunch to the entire dish and provided a nice contrast to the chewy sashimi cubes. If chirashi and beef do aren’t your thing, you can always try the other dons available which include their Salmon Teriyaki Toji Don (Mini S$7.50, Regular S$13.90), Chicken Teriyaki Toji Don (Mini S$4.90, Regular S$8.50) and Ebi Vegetable Tendon (Mini S$4.90, Regular S$9.50). Japanese curry has always been regarded as one of Japan’s most well-loved comfort foods, which is why Sora Boru has an entire section of their menu dedicated to this perennial favourite. Every bowl of CurryBoru here is drenched in a gratifyingly rich curry sauce that is cooked with a secret recipe that has been fine-tuned and perfected for months. Mildly spicy with subtle hints of fruity acidity, this robust concoction packs on a lot of flavours without being too cloying. Based on how much heat you can take, you can also choose between two levels of spiciness. Each bowl of curry rice is paired with one type of deep-fried meat or seafood. Some options available are the Chicken Katsu CurryBoru (Mini S$6.50, Regular S$10.90), Shabu Beef CurryBoru (Mini S$6.50, Regular S$10.90) and Breaded Ebi CurryBoru (Mini S$6.50, Regular S$10.90). If you’re feeling more peckish than usual, you can opt for one of their curry combo sets which are the Breaded Ebi with Shabu Beef CurryBoru (Regular S$12.90) and the Breaded Salmon with Shabu Beef CurryBoru (Regular S$11.90). Sora Boru also has a selection of noodle options for you to tuck into. The cha soba here is springy and cooked to a nice al dente which goes perfectly with the chilled, savoury dipping sauce or warm soup. The cha soba can also be enjoyed with your choice of accompaniments such as Ebi Vegetable Tempura (Mini S$7.50, Regular S$12.90), Chicken Karaage (Mini S$6.50, Regular S$10.90) and Chicken Katsu (Mini S$6.50, Regular S$10.90). If you’d like more food for sharing (or if you’re simply ravenous), get some sides to go along with your mains. The recommended picks are Chicken Gyoza (S$8.50 for 6 pieces), Chawanmushi (S$1.90) and Yasai Corn Tempura with Tartar Sauce (S$5.50). Our favourite of the lot is the Crispy Salmon Skin with Egg Mayo Dip (S$8.50) which features insanely crispy slivers of fish skin fried to a lovely golden brown. The egg mayo dip adds an addictively sweet and savoury touch to the salmon skin and we couldn’t stop ourselves from slathering everything on sight with it. 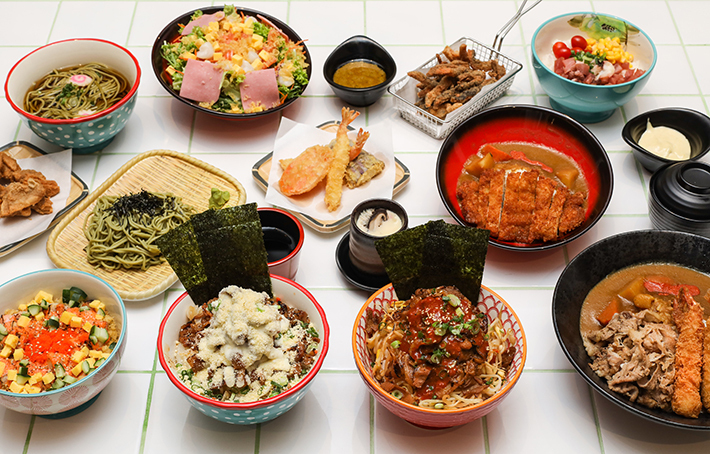 From 17 to 30 April 2019, quote “ladyironchef” or flash this advertorial when you order any Regular main and get any Mini of your choice at Sora Boru! This post is brought to you by Sora Boru.